Big thanks to Campbell Barton for reviewing, and to the Blender Development Fund for sponsoring the work, and to everyone who has uploaded builds, tested the modifier, and provided feedback. Any new bug reports can now go to the Blender bug tracker. Yay, glad to see sculpting getting love for 2.64! MUAAAAAHHAHAHAHA GOOD NEWS NICHOLAS THANKS VERY MUCH!!!! Yes! Thankyou very much for working on this tool and listening to our feedback! This is awesome! This feature should be incredibly useful for rapid basemesh development. Do you have any ideas on what your next Blender project will be, now that skin modifier is in trunk? I, for one, would really like to see Ptex and/or source image overlay for sculpt, vpaint, and texture paint modes. This may just be wishful thinking since I have no comprehension of the work that would be involved in taking these projects from their existing stages of completion and getting them finalized. Whatever your decision, I have every confidence that it will be a fantastic contribution to Blender. Anyways, best wishes to you in your future endeavors. Yes, I’ve seen it. I have to say, I’m quite surprised how both the SQM and B-Mesh papers almost ignore the issue of concave surfaces. Most of the issues the skin modifier has relate to concavities. your right, from what i see this metod is good but the generate mesh of the bmesh look better for me. I know you can fix it…. I’m really excited about this, I always wanted to try creating Base meshes with this method since Zspheres but never wanted to download and learn ZBrush. Shouldn’t it be named something like Skin Mesh instead of Skin Modifier? Another great improvement for Blender sculpting. I just did my first character using skin for my base mesh and I was able to get my base mesh ready for sculpting in no time. It did seem to break at complex areas like with my hands/finger area. I just applied the modifier and tweaked the mesh. Overall it was a great experience and saved me a lot of time. I actually did not realize that there are parameters in the skin modifier that I can mess around with. Might fix the problem. I will try it next time. Is possible implemente that function in skin modifier ? Not sure which feature you mean? Rigs can already be generated from skin. If you’re talking about outline sketching, that feature is not planned. Sketch and automatic merge mesh. Merging can be done by creating an edge between two isolated skin regions. Sketching is not currently planned. I’m really excited about your skin modifier, but when I went to download a windows build of I couldn’t find any. GitHub tells me the page is not found and Graphicall tells me that “there were no builds found with these parameters.” Have all downloads been removed now that the modifier will be included in the next version of blender? If it is at all possible to get the modifier before the next blender release (preferably a 64 bit windows), could you point me in that direction? 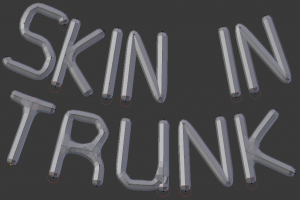 Any recent trunk build from the past month or so should have the skin modifier now. Thanks for pointing me in the right direction! I’m using your skin modifier now :) Great Stuff! Would it be possible to change the behaviour of the modifier slightly so that faces in the reference mesh are actually filled? This would allow for the creation of wing membranes, etc. It also seems pretty intuitive IMO. You can create membranes by marking a branch vertex as “Loose”. If that vertex and its neighbors have a relatively small radius, you can stretch them out into a membrane. I use your modifier a lot for 2d purposes, because it can get branches unlike curves), would it be possible to only get a side, so a 2d version checkbox ? At the moment I apply your modifier, select top vertecies and delete them, but it makes extensions really hard after.